In an effort to seek understanding in these troubling times, Bryan Edward Hill did what most Black people would understandably be terrified to do: have conversations with avowed white supremacists. Those conversations, during which Hill sat at a table across from people who have been ideologically trained to hate him, served as the basis for his new racially-charged comic book, American Carnage. Carnage, whose first issue is now available, is centered around Richard Wright, a troubled, biracial ex-FBI agent. 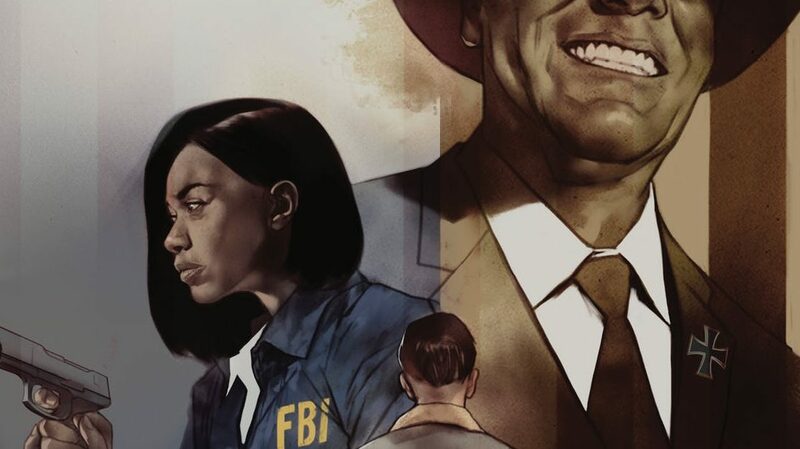 Wright goes undercover to infiltrate a white supremacist group led by a shadowy man named Wynn Morgan, who might be responsible for the lynching of another FBI agent. American Carnage is Hill’s first work under DC Comics’ Vertigo imprint. The screenwriter has also written Batman and other characters for DC. His research for the book taught him things about supremacists that he wasn’t expecting. theGrio: How did you get your start in comics? Hill: They were the first books that I bought with my own money so I have the most intimate connection with the medium. But I didn’t start to write comics until after I’d already become a screenwriter. The hardest part for any writer who’s trying to get into a medium is getting people to read before they know who you are, otherwise, you’re just a name they haven’t heard with a bunch of words they have to read. After I had sold some screenplays and some momentum in other media, I had a little more context. theGrio: How did you come up with the concept of American Carnage? Hill: I was very disturbed by the Charlottesville incident and that we still live in an age when that kind of violence could take place. When I get disturbed, I run towards the fear, so I started doing research into white supremacist movements. I really wanted to understand how they got to where they were and not challenge their views because when I see something I think is monstrous, my first question is, how did you become this? No child is born wanting to be a monster. I didn’t know if it would turn into a blog, a TV pilot, or new screenplay, but around that time Vertigo reached out to me to see if I had any ideas for their 25th-anniversary re-launch. I told them I had something probably way scarier than anything they wanted. theGrio: How did you link up with white supremacists? Hill: First I tried message boards, which weren’t that helpful because it was just a bunch of Internet primal screaming. But I reached out to social workers I know who know people that used to be part of the movement. I wouldn’t suggest anyone do this work because it’s kind of dangerous, but there’s a strange thing that happens when you sit across from somebody: no matter what their ideology, eventually human nature takes over and a person wants to relate to you. We got past the initial rhetoric and propaganda and I just heard stories about people unsatisfied with their level of agency in the world. I did more listening than talking because it wanted to absorb their perspective and I try to reflect that in the book as accurately as I can. theGrio: Why did you make Richard Wright biracial? Hill: I grew up poor, but I was also a scholarship kid so I went to a lot of well-heeled schools. I always felt like I was caught between two different identities and I wanted a character similar to that would allow me to convey my own experiences about trying to understand identity. I also thought it would be interesting to have a character who could not identify himself as one specific race inserted into these situations because it seems like a rich landscape for drama. I have plenty of biracial friends and I wanted to honor their life experience by getting to the marrow of what identity is, what it means and where within it we claim our power. theGrio: Who does Wynn Morgan represent? Hill: I didn’t have anyone in mind in particular. He’s not a Trump archetype because [Trump is] a simple creature, not interesting enough to dramatize. I wanted a man who is more in service of his narcissism that he is of any particular ideology; he’s an amalgam of all the pied pipers who lead us toward negative points of view in service of their own glory. Wynn is that guy with the covered wagon coming into the town saying you can make it rain if you just buy a snake oil. In this case, the snake oil is violent identity politics. theGrio: How did you think DC Vertigo would receive such a racially charged book? Hill: I try to be as honest and forthright about my intention as possible with my work; I do things that speak to me in the moment and hope they have value for people. I don’t live a creative life worried about whether people will be receptive to it. In this case, DC Vertigo has been very supportive of me from the beginning. I know this is a provocative work that will upset and irritate some people. I’ve got angry people coming at me on the Internet, but I’ve never tried to slap a hornet’s nest with a bat. I’m really just trying to unearth things inside of my own spirit and soul, and take my own journeys through darkness. The result of that journey is a narrative that I hope has value for people as something that makes them think and something that entertains as a thrilling crime story as well.